United States Senator Lindsey Graham has crossed the line. His negative interference in Middle East affairs is well-catalogued, but his latest statement — made while he was cosying up to the Turkish president — not only goes beyond the norms of diplomacy, but is also out of line with the White House. Relations between the US and Saudi Arabia cannot progress until Crown Prince Mohammad Bin Salman is “dealt with”, he said before accusing the kingdom of throwing its critics in prison. The hypocrisy was particularly glaring considering that he came out with that slur while visiting a country that is the planet’s biggest jailer of journalists and activists. Turkey is of course unassailable due to its hosting of a US airbase, its membership of Nato and its role in keeping asylum-seekers from reaching European shores. The irony is that Graham and his cronies are the ones leading the charge against Russia for attacking America’s democracy by interfering in the US presidential election via propaganda. Yet, their jumped-up sense of exceptionalism knows no bounds. They openly threaten to ruin relations between their nation and its oldest and closest Arab ally if it fails to “deal with” its crown prince, a man who is spearheading the kingdom’s economic and social revolution. Just imagine the outcry were an Arab parliament to lobby the US to get rid of its commander-in-chief! Prince Mohammad Bin Salman deserves praise for his courageous reforms benefiting women and youth. He has limited the powers of the religious police, opened up the country to tourism and introduced cinemas as well as sports and entertainment venues. Last year, women celebrated their right to drive and to start their own businesses without requiring permission from a male guardian. Moreover, for the first time, divorced mothers automatically receive custody of their children. Most importantly, he is the architect of a bold 15-year plan to diversify the economy away from oil — Vision 2030. He has made great strides in stamping out corruption, combating terrorism and has announced his determination to return his nation “to what we were before, a country of moderate Islam that is open to all religions and to the world”. In that spirit, Saudi has signed an agreement with the Vatican, aimed at building churches for Christian residents and in March last year, during a visit to Egypt, the Saudi crown prince met with Coptic Pope Tawadros II. Under his father’s guidance, the young and energetic crown prince is delivering freedoms and opportunities that young Saudis believed were unattainable just a few years ago and he has gained the love and respect of the vast majority of his people in so doing. How dare Graham even so much as attempt to steal the future of 33 million citizens of the Muslim world’s most influential nation. Last month, Graham and five other lawmakers without a shred of proof introduced a resolution in the Senate demanding Riyadh hold the crown prince personally responsible for the killing of the Saudi national Jamal Khashoggi, whose pro-Muslim Brotherhood/anti-Saudi columns in the Washington Post were shaped and edited by a Qatari think-tank. 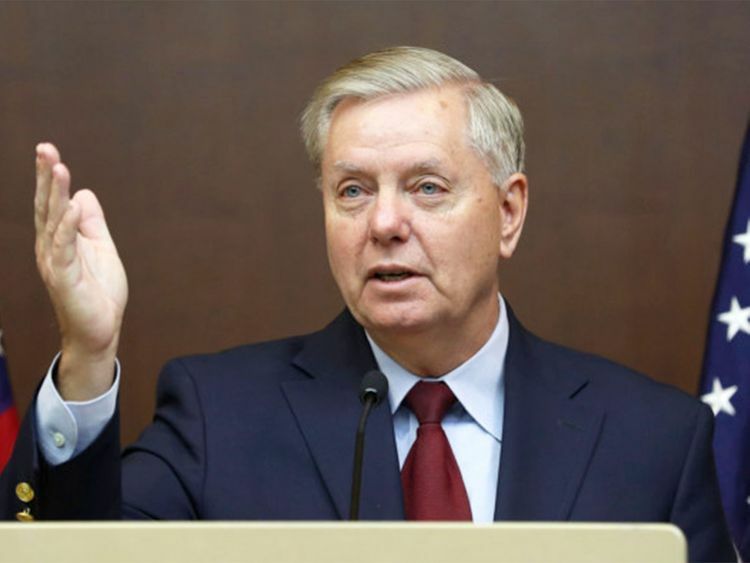 Interestingly, Graham has been piling pressure on Riyadh to mend fences with Qatar that refuses to comply with the Saudi-led quartet’s terms. Graham has accused Saudi of imposing an embargo on Qatar “without talking to us”. In February last year, the CEO of the Qatar Investment Authority met Graham to discuss mega investments in infrastructure and real estate. Khashoggi did not deserve to be murdered and those responsible are on trial for the crime, which has scarred the country’s reputation. However, as he was a Saudi national, his fate is no business of US lawmakers who seemingly care not a jot for the well-being of the Saudi people or the region and who erroneously believe they have a mandate to interfere in the kingdom’s domestic affairs. Graham’s own record on foreign affairs is dismal. He had loudly accused former Iraqi president Saddam Hussain of lying about weapons of mass destruction and laughably hailed America’s occupation of Iraq responsible for the deaths of up to one million Iraqis as “an opportunity to demonstrate to the Arab world that the rule of law matters”. He expressed delight at the Muslim Brotherhood’s hijacking of Egypt’s revolution in January 2011, championed the removal of Libyan leader Muammar Gaddafi and encouraged the arming of Islamist fighters in both Libya and Syria. Frankly speaking, American lawmakers have no moral platform to point fingers when a cursory glance at US meddling in the region over more than half-a-century should be a cause for shame. The holier than thou should work to close Guantanamo where detainees are still being held without trial, reunite families cruelly separated at the US-Mexican border and restrict gun ownership that robs the lives of more Americans than all wars put together.